With the weather forecast suggesting showers are likely between now and Sunday’s Tour of Flanders and rain on the start line in De Panne today, here’s a quick look at an item of pro kit that’s not often featured: the rain bag. 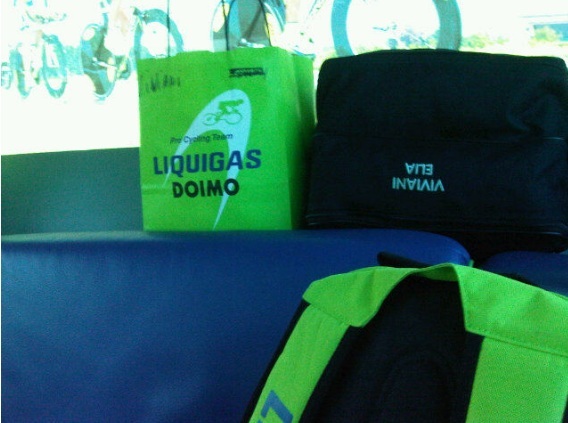 This is a small bag belonging to each rider containing the clothing they need on a rainy day. It’s packed into the team car and can be brought out in case of rainy weather. The pro cyclist’s version of an umbrella. I’ve struggled to find readily available photos but the photo above is a camera-phone pic from Liquigas-Cannondale’s young fastman Elia Viviani taken from the Three Days of De Panne. You can see luggage in his name but separated into different bags and one of these is going in the team car for the race. The idea is that a rider can drop back to the team car and pick up the supplies they need, either for themselves or for their team mates. Jackets, gloves and shoes are all individual to a rider and they need these spares in the team car, just as the team car carries spare wheels and oil. Often the bag will include spare items, for example a dry pair of gloves. Some riders hate riding in the rain, some dislike it, some try to profit from it knowing that others hate it more than you do. Few tend to enjoy riding in the rain but at this time of year it is part of the job. Having warm and dry clothes on hand is essential. I know I’m one of the sick twisted weirdo’s in my local bunch, but I absolutely love riding in the rain! I love racing in the rain too – I know at least half the field doesn’t want to be there and I know most of the rest are mentally racing for a finish. Thank you for covering this. It is something I have long been familiar with, but few others have. How much of that kit can they put on while on the move? I know you can often marvel at the pro’s balance when they crest a peak then in full flow (and sometimes in the middle of a downpour) put a rain jacket on while cruising down the descent, but I don’t think I’ve ever seen anyone putting on knee/leg warmers or fitting overshoes! Could you please add ‘gilet’ to the lexicon. Most pros seem to be able remove or put on pretty much anything while riding – jackets, vests, leg warmers, shoes. About the only thing they can’t take off are their bibs. I’ve heard plenty of stories of people out riding a training ride or sportive with pros of lesser or greater fame, who, when the action looked like it was going to heat up, casually stripped off their leg warmers while riding along, then put the pedal down. Spend your life on a bike, and I imagine that these things become second nature after a while. Glute cramp: good for you, it’s one of the “when the going gets tough, the tough get going moments” and as you say, many have their mind on something else. Yorkie: as grolby says, it becomes normal. It’s part if the job. But often once you are up to speed you don’t need to add much more as you’re warm. Taking leg warmers off is easy. Just slip your leg warmer down to your ankle in a bunch, then unclip, then pull the legging over your shoe as one big clump, then clip back in, put the legging on your pocket and repeat the other side. Keep one hand on the bar at all times, this isn’t a clown show. Not seen anyone try to put them “on” while riding though. I think there used to be a vid of the American Marty Jemison doing it, but I could be mistaken. Funny you should pick a wet weather image with a Liquigas rider to illustrate. I’ve got the better part of a Liquigas rain bag from last season – gilet, rain jacket and arm warmers. The jacket has very elastic material around the cuffs making it very easy to get off, plus a velcro fastening front. The gilet is essentially the same without the sleeves. Both are heavy duty waterproof material. Not your packs-down-into-a-jersey type but real stormproof gear. Wore it in one of the most torrential downpours and it more than did the job. I’ve also got a dry weather gilet which is basically a sleeveless jersey in a slightly thicker material, no windproof material at the front.